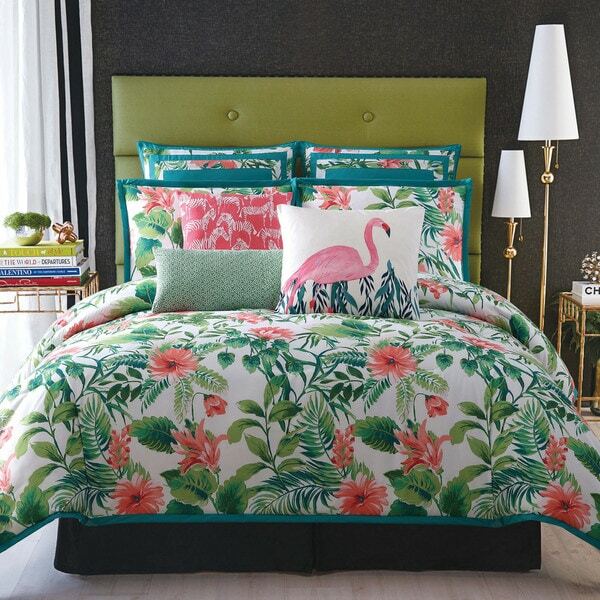 Christian Siriano Tropicalia duvet cover Sets bring an exotic elegance to the bedroom. Large scale foliage decorates a solid white or black background, depending on your preference. Available in 2 colorways. Face and back are printed 100-percent microfiber polyester with polyester fiber filling. Another Winner. This duvet cover is simply beautiful. We are remaking the master bedroom in a tropical theme. Couldn’t be more pleased. It brightens up the whole room, and is the focal point upon entering the room. With all of the great purchases we have made from Wayfair for our makeover. We are going to hold a cocktail party for our close friends to unveil the results when completed. Beautiful. Would definitely buy again. Easy to use. Colors are bright and is so soft. Favorite of all my bedding. Highly recommend! "Does this duvet cover have tabs or ties on the inside of the corners to secure the duvet?"